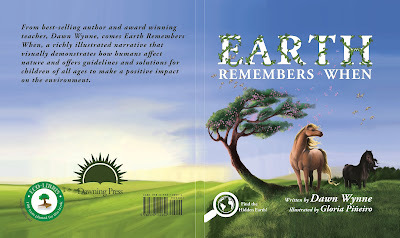 New children's book, Earth Remembers When by Dawn Wynne, is going green with Eco-Libris! We're glad to update you on a new children's book that is going green with Eco-Libris: Earth Remembers When by Dawn Wynne. 100 trees will be planted with Eco-Libris to green up this great book that offers guidelines and solutions for children of all ages to make a positive impact on the environment. You can find our logo indicating that 100 trees are planted for this book on its back cover (see picture below). From best-selling author and award winning teacher, Dawn Wynne, comes Earth Remembers When, a richly illustrated story that visually demonstrates how humans affect nature. It offers guidelines and solutions for children of all ages to make a positive impact on the environment. Filled with facts, tips, activities, and recipes, Earth Remembers When provides children with unique knowledge about animals and the planet along with self-empowering methods to make a difference in our world. The book is not available yet for sale, but in the meantime you're welcome to check Dawn's other book "I Remember When," which is available on her website.